Oh my goodness, have I been busy! I've been preparing for an upcoming show and, let's just say, it's resulted in a frenzied attempt to make as much as possible! 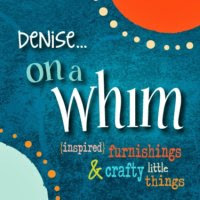 I'm sure everyone out there who does craft shows can relate! But today I'm returning to finally show you another one of my kitchen updates. 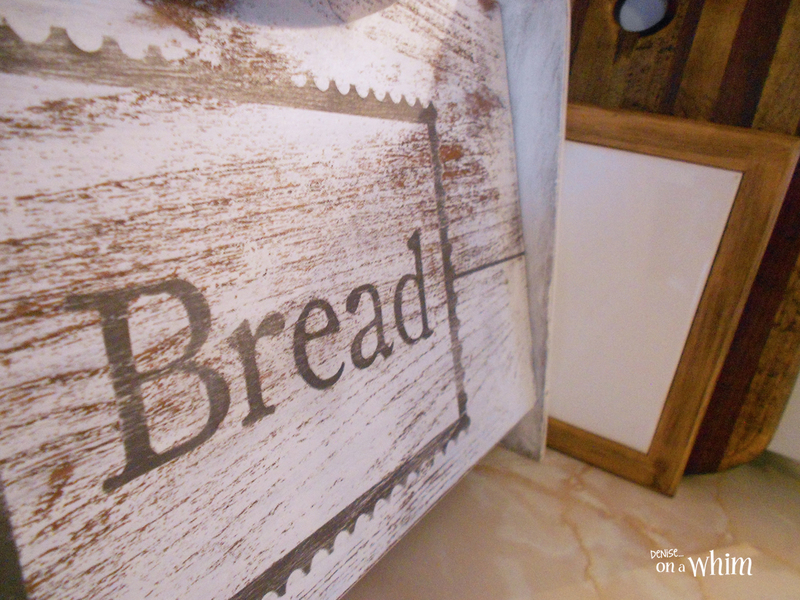 This thrift store bread box got a quick update with paint and lettering and it so fun in my kitchen! 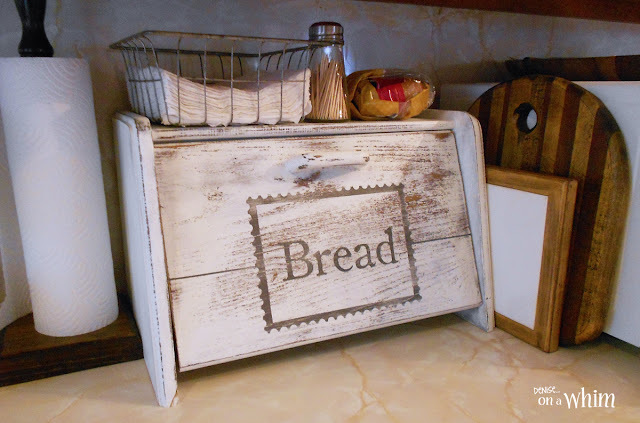 I bought the breadbox at a thrift store for $3. It was a light colored wood. Not quite what I wanted in my kitchen decor. 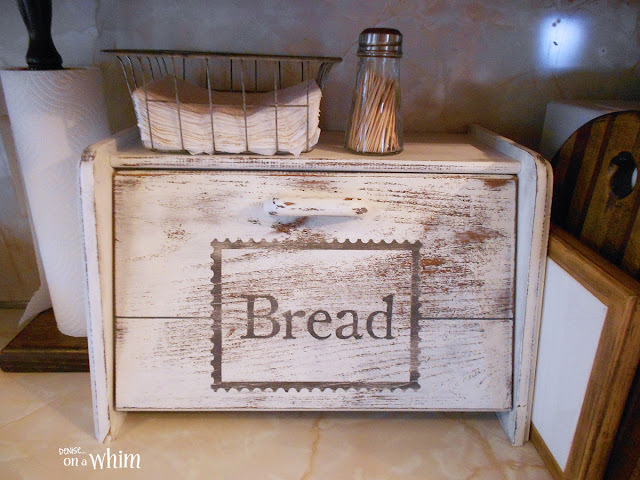 But I did want a breadbox because my bread had been just sitting rather unattractively on the counter near the fridge. I painted the breadbox with white chalk paint. Then I applied my adhesive vinyl stencil. After painting the lettering, I removed the stencil and, as is sometimes the case, it stuck a little more than I had intended and took some of the white paint off with it. But that was really no problem. Just resulted in a slight change of direction: instead of lightly distressing the edges of the box, I distressed the entire thing, including the face, more heavily. That way, the paint that peeled off blended right in with the rest. Doesn't even look like an oops now! The heavy distressing and stamp-style graphic I chose as a border for the word Bread coordinates nicely with the rest of my vintage decor. I added a dark-stained thrifted breadboard and a trivet I already owned between the breadbox and the microwave to break up the white. 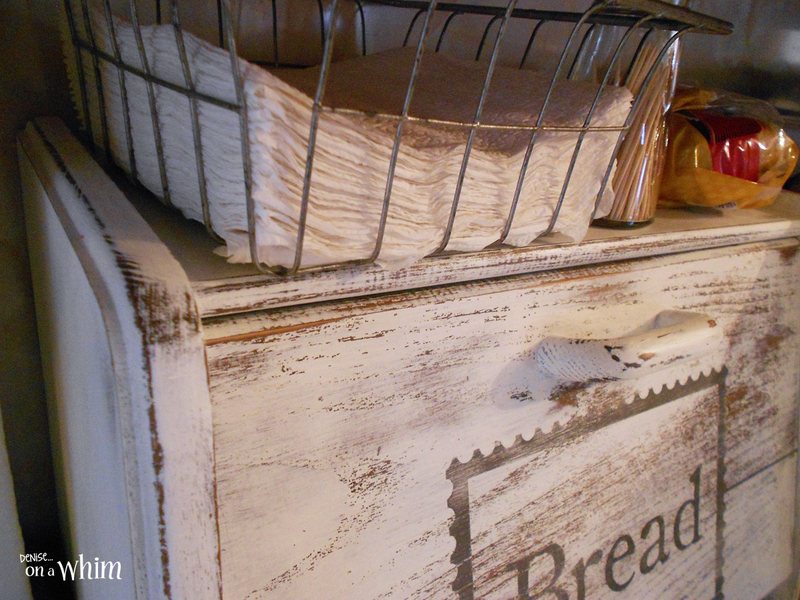 To the left of the breadbox is a thrifted paper towel holder, another piece I had been lacking in my kitchen before. On top of the breadbox, an old salt shaker makes a great place to store toothpicks and a wire basket I found at the store is the perfect size to hold napkins! I'm loving my new kitchen decor! Did you see the rest? Check them out. You just might be inspired to make an update or two in your own kitchen!